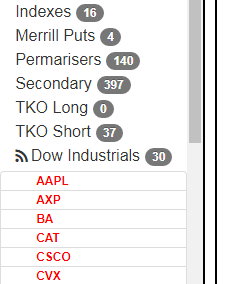 Preloaded Watchlists are basically ready-to-use lists of common groupings (like the components of the S&P 100, the Dow Industrials, and so forth) which you can fetch with a mouse click. I’m planning to add plenty more lists, too, in order to save you – – yes, you – – time. 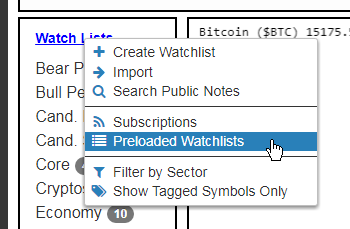 Premium users will recognize the dialog box that comes up next, since it resembles the Published Watchlists feature. You can see the lists, their descriptions, and Subscribe or Unsubscribe to any of them by choosing the corresponding dropdown.